Last year, my husband and I dragged the kids across town just so I could look at some books. 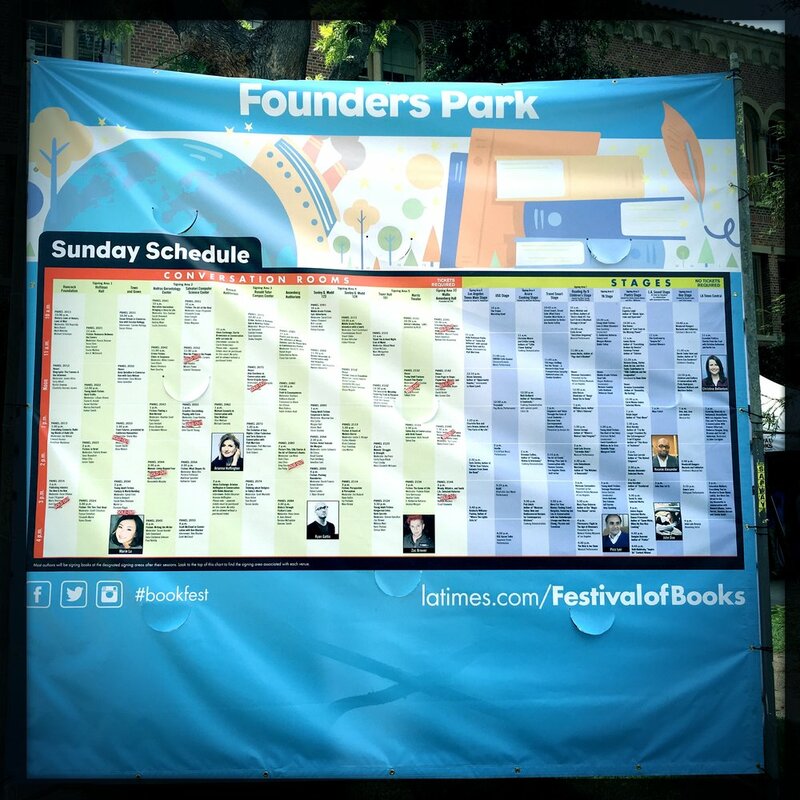 That was my first success, after trying and failing 2 years in a row, to make it out to The Los Angeles Time's Festival of Books or #Bookfest. It was almost unbearable with the high LA temperature, my rambunctious kids, and the less than interested husband. Plus the traffic sucked. The parking sucked. My kids thought the food sucked. I don't even remember buying any books, and we left soon after we arrived. This year I took a Lyft and spent the afternoon alone. Actually, I wasn't alone at all. 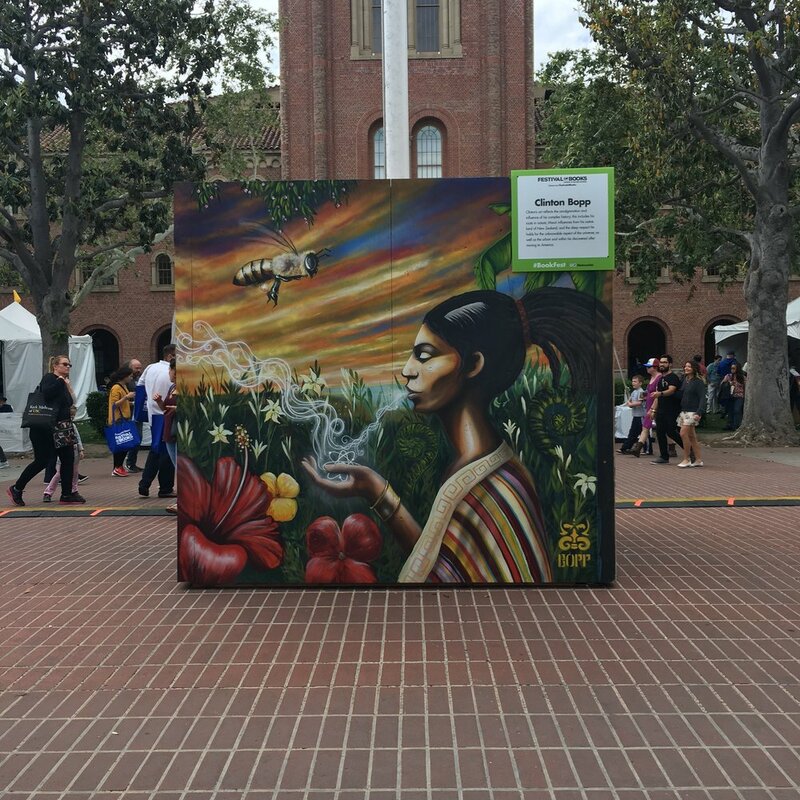 #Bookfest is the largest book festival in the U.S., and I was very much NOT alone. The traffic was atrocious this year too. After some pleading, I convinced my non-English speaking driver to drop me off on the side on the road. Then I spent time orienting myself to the USC campus. I sort of knew where things were, so I wandered until I found a map and a crowded area. As I made my way to the main stage area, I tried to pay attention to the building names and panel times. Even though the buildings had posted signs indicating a panel would be there, the sign did not give the panel names or times. What I ended up using more than the guide was the large schedule posted near the event hub. I wrote down a list of the panels I wanted to visit, feeling well-scheduled. Unfortunately, I hadn't planned far enough ahead to get tickets to the shows that needed them. The event I wanted to see the most, Kwame Alexander reading his poetry, was free and outdoors-meaning little chance that it was "sold out." It was almost too good of a deal! In the free books area, I stood in lines to meet authors who I had never heard of. Genres featured self-help, novels, memoirs, and even some poetry. Everyone could find something of interest that you could take home for free. Not a lot of time for a chat, I was able to get some pictures with self-published writers. It was amazing to see all the people who were putting their work out into the world. After I had collected a few titles, I had some time to kill and decided to get lunch. Note: I have two children under the age of 5, and I almost didn't know what to do with myself. I got food, ate, and even read a little before heading back to the poetry area. I have never gravitated to it, but I do like poetry. Reading poetry and hearing it spoken to you are so different. I haven't heard it at all lately, so I ventured out of my comfort zone to listen to Kwame Alexander. Alexander was the winner of the Newberry Honor Award in 2015 for his young adult novel, Crossover. I didn't know much about him, but he was featured in the festival info. His newest book, Booked, is a young adult novel about a middle school boy who loves soccer. I was not prepared for what I sat through. He made me laugh, cry, and question why I only had 3 books of poetry in my personal library. And why were none of them written by him? He shared his experiences of working with juvenile inmates, and how his poetry helped connect with them. He joked about being a dad but performed a gripping piece about the fears that come with paternal parenthood (you can listen to a version here and it will make you cry). He told stories about his past, his relationship with is father, and how he transitioned from love poems about his wife to novels for middle school students. What did I come away with from hearing him? To take risks, and read more poetry. "Poetry is food for the soul." At the end of his half hour, I quickly went to shake his hand. I was completely star-struck! Personable, his friendly demeanor wasn't just an act. Although he had more important places to be, he patiently listens to me praise his work and talk about the site. Of course, I want to get the news out as much as possible. Then, he introduced me to a friend and fellow author. We all chatted for a while, but he soon had to go and sign books. You can learn more about him here, and pick up a copy of his latest book here. The rest of the day was spent wandering the festival, and talking to independent writers. I loved seeing all the black women promoting their work, or recently published books by their relatives. Their books of poetry, sci-fi, and world traveling biographies were inspirational. 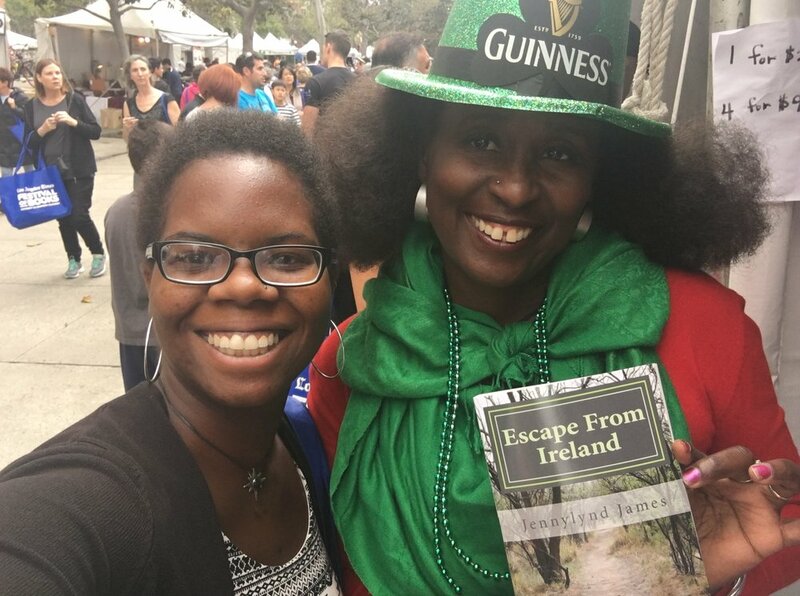 I received a lot of encouragement for Black and Bookish- remember, the site was only a few months old with one or two reviews. The support told me I was on the right track and that there was a place for black books and black stories.